First thing this morning (I was still in bed in a semi-coma), my four-days-shy-of-85 year-old father called. Dad (enthusiastic): Who’s gonna win the Oscars tonight? Don’t tell me you were sleeping – get the hell up! Dad: I saw The Artist. I liked it! I’m okay with that. I also liked The Descendants and I liked Hugo; didn’t think I’d like that one, but I did! It was damn good! Did you see it? Did you like it? My father, as usual, ignores my response. Dad: Did you see Iron Lady? Meryl Streep was terrific! But I hated that movie! She should win it, but if you ask me, I’d also give it to that one that played in The Maid. She was terrific, too! And that was a damn good film! Me (perking up): You mean Viola Davis in The Help, right? Dad: Yes! The Help! Did I call it The Maid? [Insert aging male growling sound before getting second wind.] I like her! Give it to her and the other one. 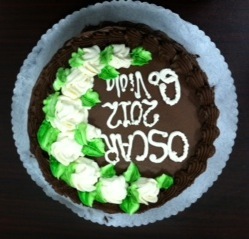 My buddy Milton shows his support for Viola with cake! Dad: Who?! I’m talking about the other maid – the one that baked that pie! Me: I know who you’re referring to! That actress’s name is Octavia Spencer! She’s up for Supporting Actress. Dad: Oh! Good. Yeah, give it to her. That way they both get one. They deserve it. Me: Let’s hope our memo reaches the Academy in time. Again, my father ignores me. Dad: Do you think George Clooney’s gonna get it? I thought he was great! Me: It might go to Jean Dujardin, the guy in The Artist. Dad: You know what? I’m okay with that! I liked him, too. Me: It’s between them [murmuring] and Uggie. My father ignores me and changes the subject. Classy lassie flaunting her unique brand of Oscar fever. Post-script: For you serious Oscar-types, my dear buddy, Milton, sitting in his East Side man cave, has wrapped his noggin around this subject in a big way. Check out his site and see if you agree with his opining. Start an argument or send him cake! This entry was posted in Humor and tagged Academy Awards, george clooney, meryl streep, movies, octavia spencer, oscar, viola davis. Bookmark the permalink. 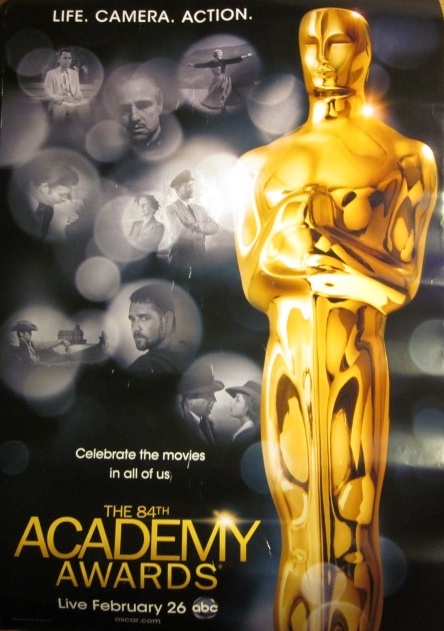 Great article and I like the way your Pops handicaps the Oscar race – tell him to come back east and him & I will take a trip to the racetrack, with his skills we will pull in a boatload of wampum on a long shot! Heavens to Murgatroyd that’s just what the world needs — My Dad Geezer and Jr. Geezer You playing the ponies together! LOL..we would make a fortune!!!!! Hey I got my ears blown! Wow how wrong does that sound?????? If you started delivering a eulogy with that announcement, very wrong, but here in Lame Adventures-land, I think that statement fits right in! Gotta love the cake! Looks amazing! If Viola wins, think Milton will send me a piece? Actually, Kathy, Milton emailed me that photo at 10:05 am Friday and emailed me again at 3:40 pm with an update, “It’s gone, and we’re in a coma.” No, Milton didn’t multiply when he was under the influence of cake; he shared it with his colleagues.